No matter whether you hunt with a compound or crossbow, these two bow holders have you covered this whitetail deer season. If you’re like most bowhunters, you rely on those screw-in style bow holders. At times they function just fine, but what do you do on certain public lands that forbid screw-in steps and bow holders? Case in point: I spend a lot of time on public land in Wisconsin, a state where such bow holders are illegal. And while the screw-in designs work well with compounds, they certainly don’t hold a crossbow in the ready position. Here are two better made-in-the-USA mousetraps. For horizontal hunters, check out the High Point Crossbow Holder. This quiet, lightweight and fully adjustable holder ($40) fits most of the popular crossbows used today. And as shown in the video below, it works just as well with a rifle, slug gun or muzzleloader once firearm season begins. If a compound is your hunting tool of choice, High Point also has you covered. 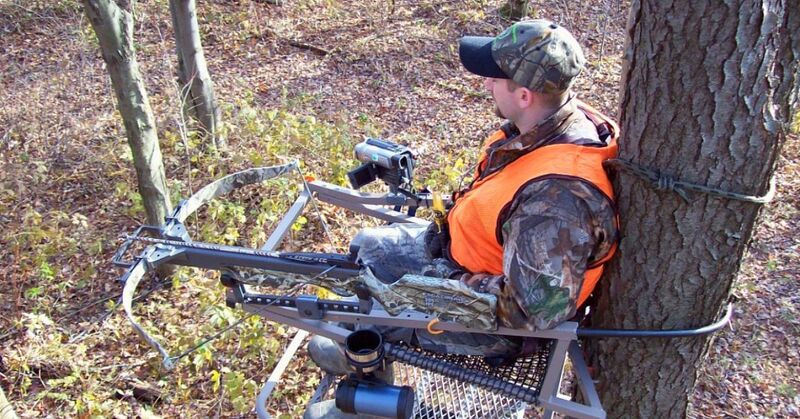 The company’s Super Max Bow Holder ($23.50) is made for the wide-limb bows popular today. It features 3.25-inch forks, is very light and like the Crossbow Holder discussed previously, is totally silent. The Super Max (photos below) rotates 360 degrees and locks every 5 degrees. You can easily attach this holder to treestands built with .75-inch or 1-inch square tubing; no tools required. Don’t be caught off-guard this deer season scrambling to grab your compound or crossbow from a screw-in bow holder. Having your bow within easy reach will allow you to focus on the task at hand.